Personalized Shamrock Address Plaque - - single-line arch shape address sign with a bright shamrock inside the arch. Holds up to five 4" numbers or seventeen 1.25" characters. Made in the USA. Shamrock, characters, and border are part of the sign, not added on. 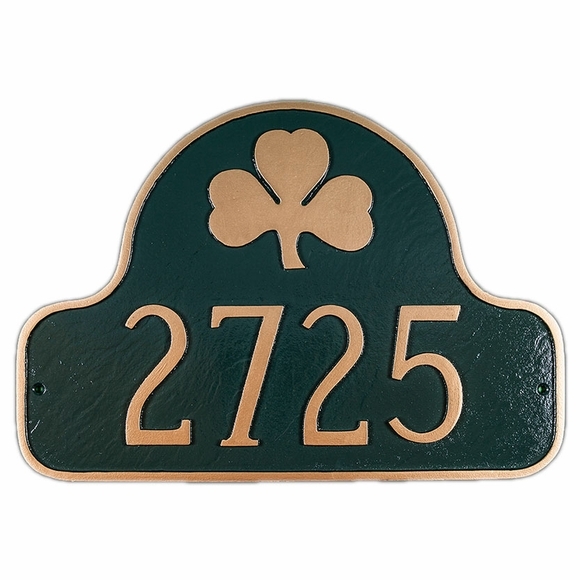 Personalized house number sign with an Irish shamrock over the house number. The plaque came in and looked exactly how I expected. Size and color were perfect. Easy to assemble.